Grey Ops: Should First Strikes be Fired by Every Marker? With the increasing availability of First Strike rounds and the similar rise in platforms capable of utilizing the revolutionary (well I guess we can argue about that) paintballs, the question begs asking, "Just because manufacturers can make all of their markers compatible with First Strike rounds, should they?". It's a question I've seen raised in not so many words in a few locations online, and there are certainly good reasons for asking it. For one, people seem to be concerned that what they perceive as a dedicated "sniper" platform will be compromised, with the niche now held by certain markers being dissolved in favor of everyone shooting first strikes at each other. Additionally, it could also be seen as superfluous, adding unnecessary costs to markers (via design and production costs) and requiring different magazines/conversions for individual paintball markers. However my opinion leans toward the ubiquitous adoption of First Strike capabilities being a good thing. Primarily because First Strikes allow for "truer" ballistics, more similar to what paintball markers aim to imitate, which means that if they were universally used the overall experience of paintball might improve (or at least allow for exchanges of fire at greater ranges). While that is definitely contingent on prices for First Strikes lowering to a point where everyone could afford them, that's definitely possible if they are used more and more and companies start to view them as more than a niche and instead a new paradigm. 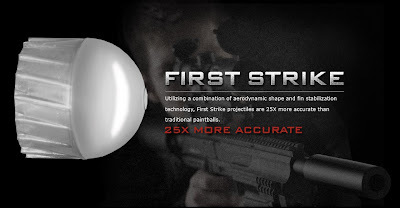 FN 303 projectiles, which First Strike rounds are based off, were designed to be a ballistic improvement on paintballs, allowing for better training usage and varied payload delivery, so if they're overall that much better than a standard spherical paintball, why not press for an eventual total switch to First Strikes.